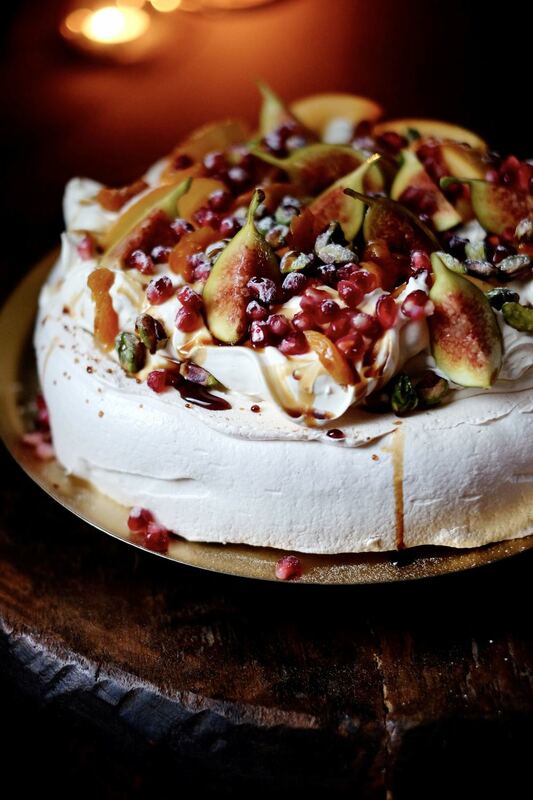 Although originally a recipe from my Christmas collection, this almost otherworldly pavlova would be an ideal treat for these sunny evenings. Preheat the oven to 160C/140C fan/gas mark 3. Whisk the egg whites to medium peaks, then slowly add the sugar in a steady stream whilst whisking constantly. Whisk until the sugar has dissolved and you have a very glossy meringue. Add the corflour and vinegar, folding in gently. Take a fingerful of meringue and dot a little bit onto each corner of the baking paper, then place that down onto the baking sheet to make sure it sticks. Dollop the meringue into the centre of the baking sheet then smooth it into a thick disk of about 23cm in diameter – I use a small crank handle palette knife, but a large flat spoon would work. Place the meringue into the oven, turn the oven down to 140C/120C fan/gas mark 1, and bake for 1 hour 30 minutes, then turn the oven off but leave the meringue inside to cool completely, preferably overnight. Once cooled, invert the meringue onto a cake stand or plate. For the topping, whisk the cream to soft, floppy peaks and dollop it on top of the meringue. Scatter over the figs, pomegranate kernels, chopped apricots, pistachios and persimon slices. Dribble the rosewater and drizzle the pomegranate molasses over the fruits, before finishing with a snowfall of icing sugar.